On 23 and 26 November, the Cairo Opera Company will present one of the troupe's highlights, Giuseppe Verdi's Il Trovatore. While Verdi is not a stranger to the Egyptian audiences, mainly due to the frequently staged opera Aida, Il Trovatore is more of a rarity. 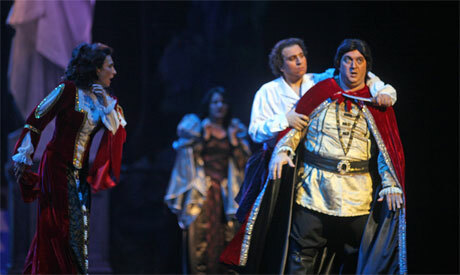 Il Trovatore has been first performed in Egypt in 1988, in the first season of the newly built Cairo Opera House building in Zamalek, and relied on foreign musicians, including the orchestra, choir and a number of soloists from Sofia, Bulgaria. The new production premiered in May 2015, when director Hisham El-Tally and conductor David Crescenzi worked with the mostly Egyptian artists: the Cairo Opera Orchestra, Cairo Opera Choir and a large number of singers from the Cairo Opera Company in cooperation with soloists from Italy and Serbia on chosen evenings. It was then restaged more than once. "Il Trovatore is a very challenging opera in many aspects," El Tally explained to Ahram Online back in 2015. "Being a Romantic composer, Verdi needs grand scenography, great costumes and the visuals must parallel the richness of his music. Il Trovatore cannot be staged as a poor theatre, neither in an experimental manner, as this format would disappoint the audiences." During two nights, the audience will be offered a special treat where we can uncover the 15th century Spain during the civil war with a plot intertwined with passionate love and hatred, the enchanting music of Giuseppe Verdi and the wonderful arias.